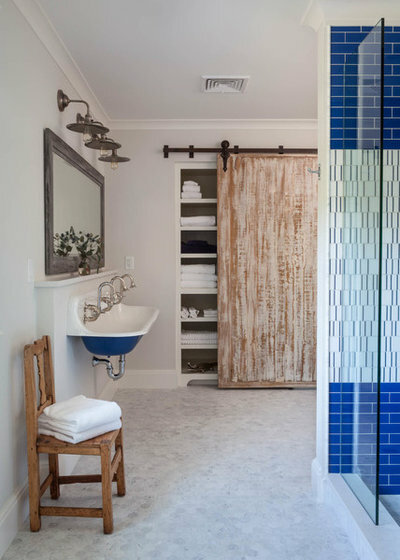 Wet towels left on the floor, cluttered vanities and arguments over whose turn it is to use the shower – sharing a family bathroom can be veer from fun to annoying to stressful. 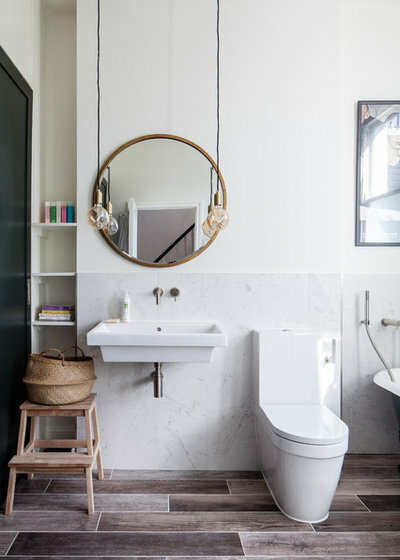 Generous storage, low-maintenance finishes and a smart layout can make a big difference to the feel and functionality of the space. 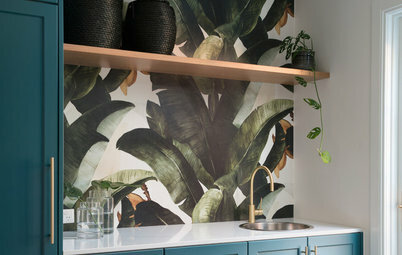 We’ve scoured the Houzz archives to find 30 fabulous bathrooms with family-friendly features to inspire your next renovation. 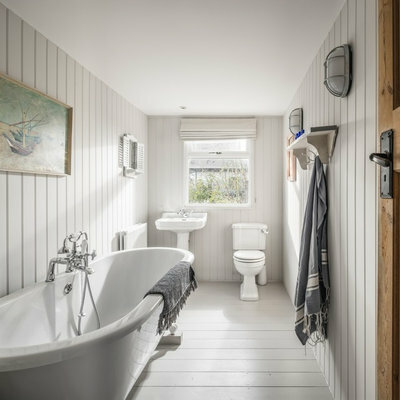 Features: Taking the joinery right to the ceiling maximises the storage potential in this small space – great for a busy, family bathroom. 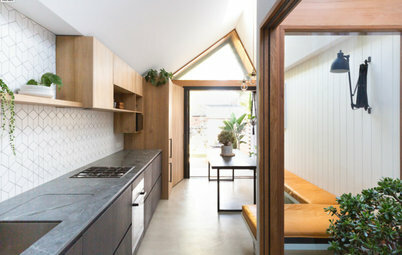 Features: A laid-back vibe, cosy tongue-and-groove panelling and lashings of light. 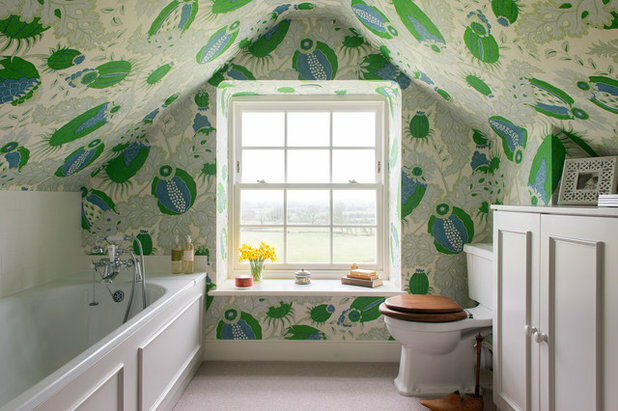 Features: Cheery botanical wallpaper sets a welcoming tone in this family-friendly bathroom, while bringing the outside in. 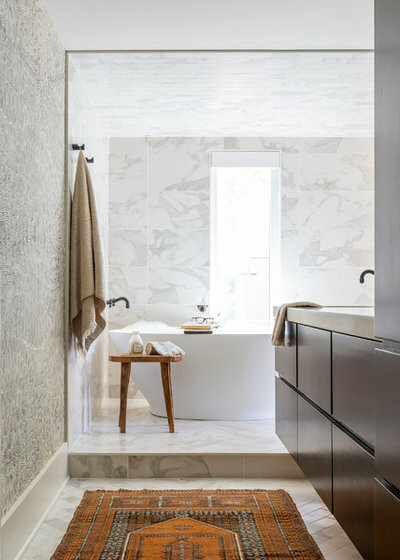 Features: Sophisticated marble is softened with warm timber tones and an intricately patterned wallpaper. Beautifully balanced. 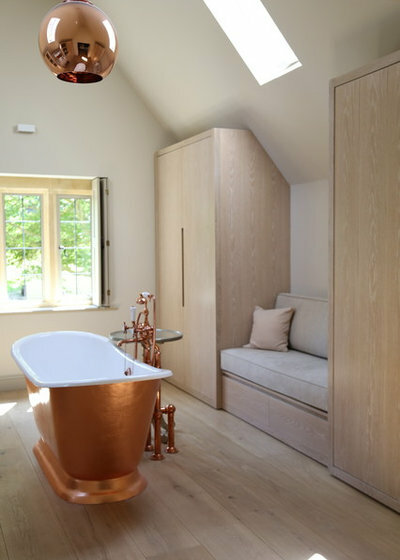 Features: A sliding barn door that conceals storage without cluttering the room – genius. 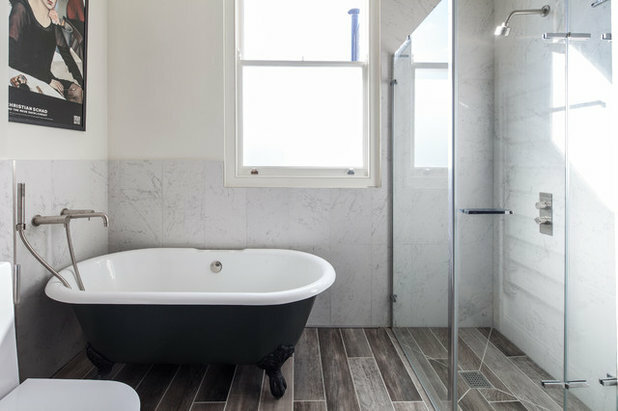 Features: Generous proportions and a sophisticated palette – ideal choices for a family with older children. 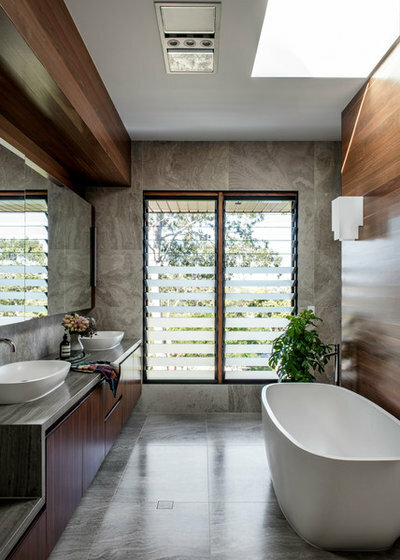 …and here’s that bathroom from another angle. 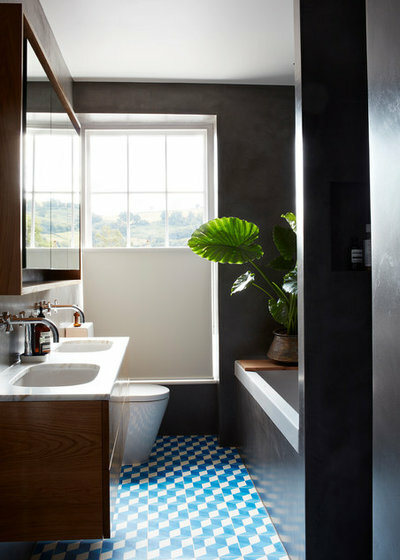 Features: Hardwearing materials and a cheery, blue-tiled backdrop. 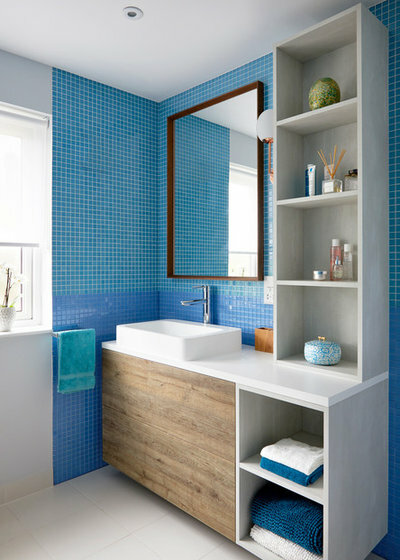 Features: Generous storage is a must in a family bathroom where you want to keep clutter and mess to a minimum. 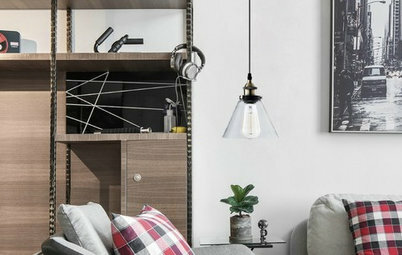 Having a mix of open and closed storage allows you to keep some items on display. 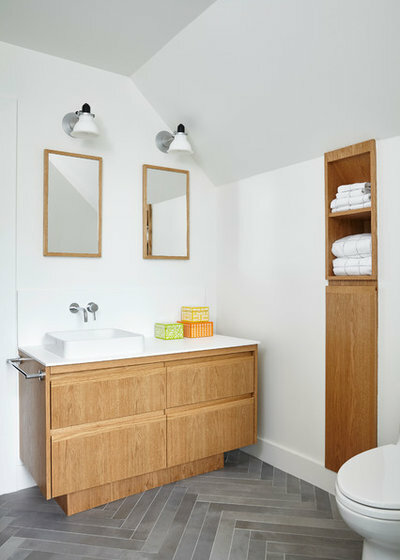 …and here’s that bathroom from another view, with its kid-friendly towel hooks. 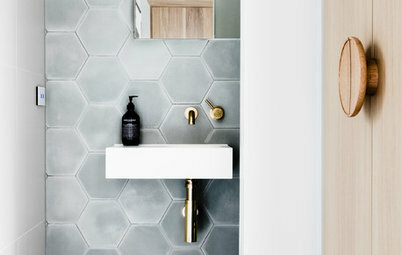 Features: Basins that mimic the simple, colourful lines of building blocks add a playful touch. 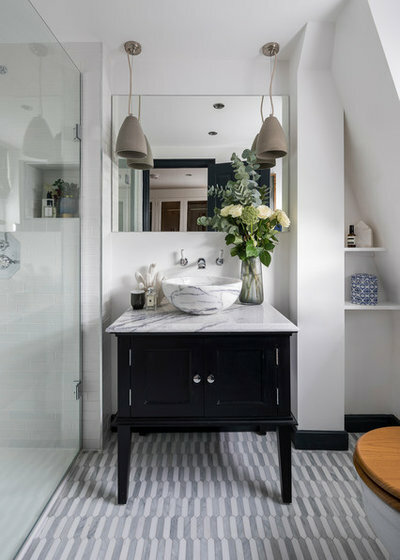 Features: A floating vanity maximises space in a small family bathroom. 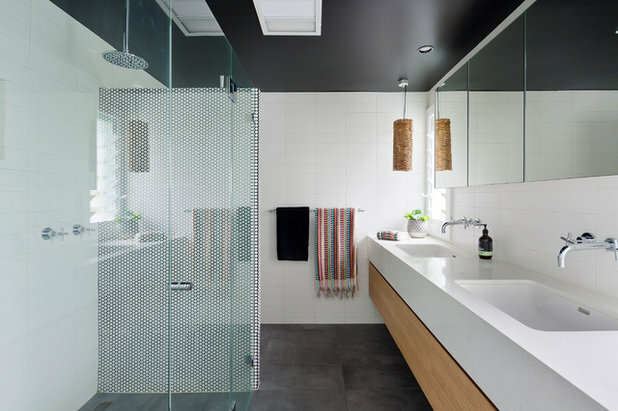 …here’s that bathroom from another angle. 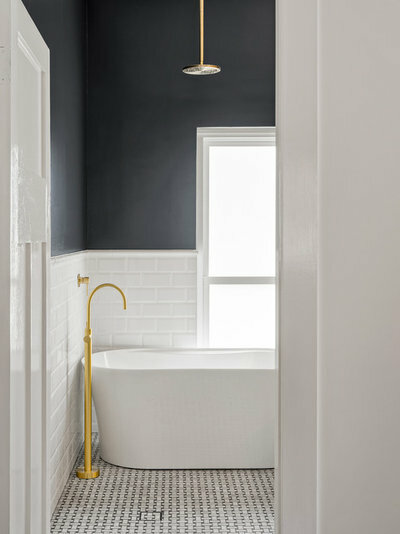 Features: A tiny family bathroom is made great with dramatic colour and materials palettes, and a space-savvy layout. 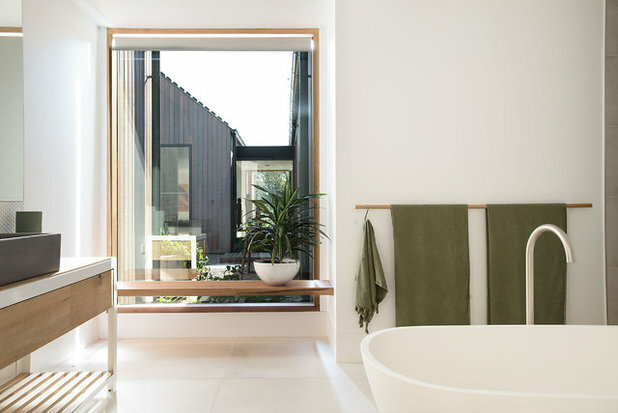 …here’s a different view of the bathroom. 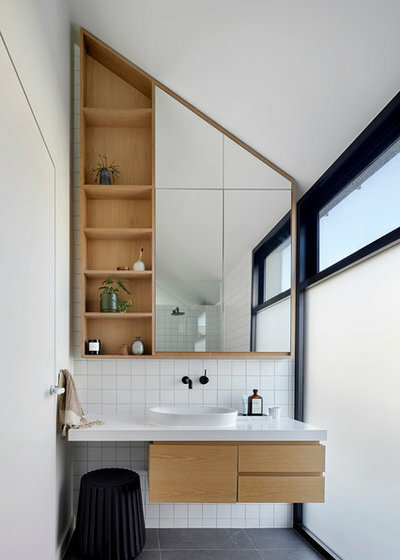 …and birch plywood storage is low-fuss and utilitarian. 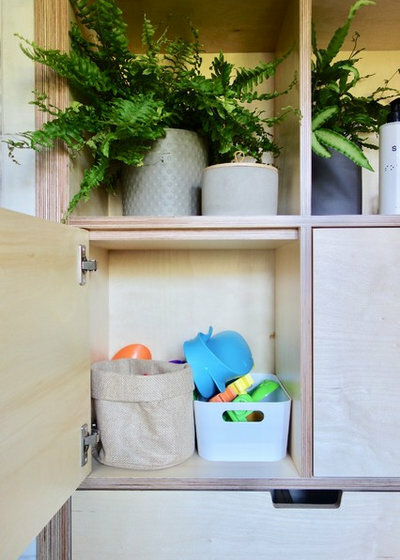 …and a great way to hide bath toys. 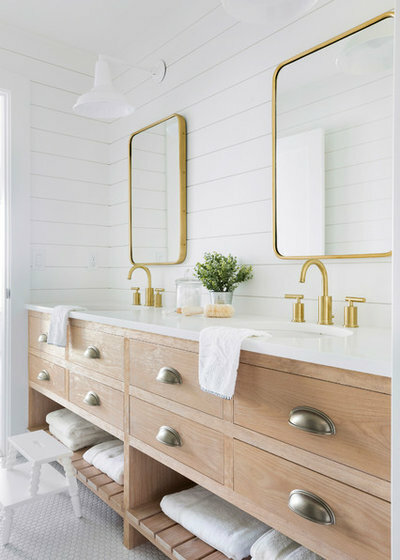 Features: A deep, freestanding vanity offers up oodles of storage in a family bathroom. …and another view. 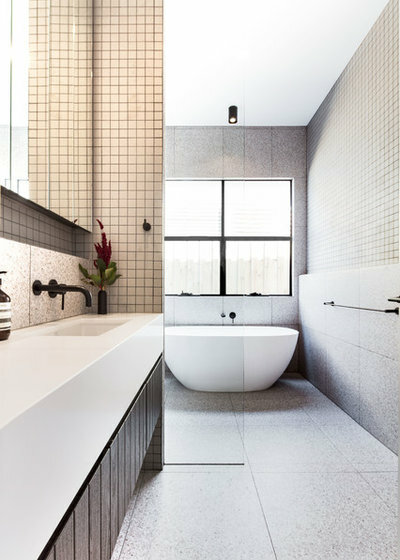 Note how a pale palette and minimal detailing visually opens up the space. 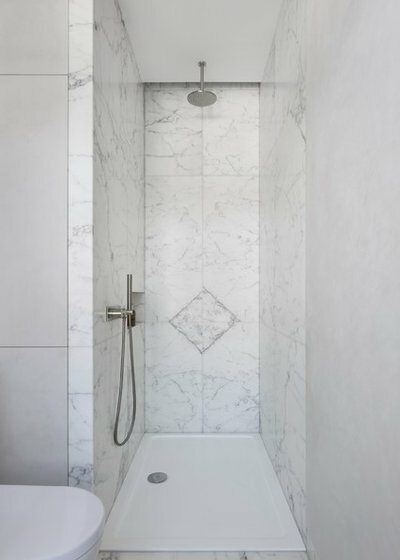 …and a view of the shower, which is rectangular in shape to suit the narrow lines of the room. 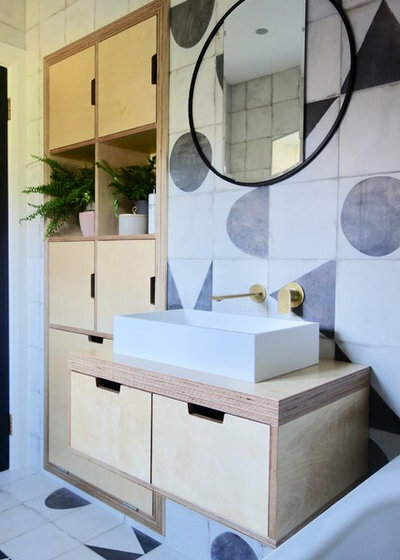 Features: Graphic grout and tiles, and generous easy-to-access wall storage are just some of the features we love here. 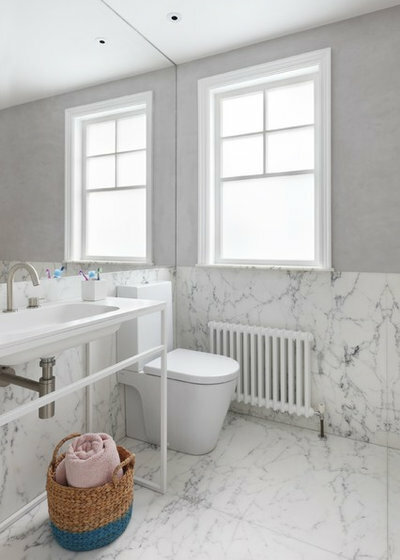 Features: Old meets new in a family bathroom. Irresistible. 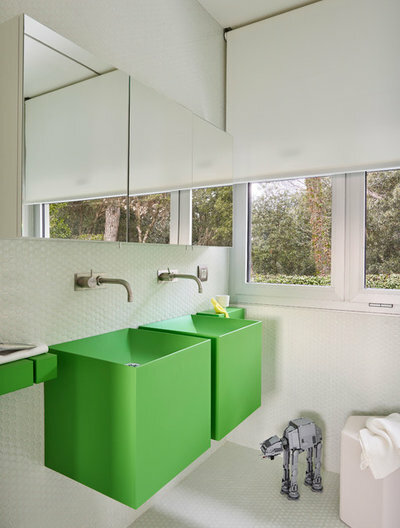 Features: Vivid green mosaic tiles add energy to this space. 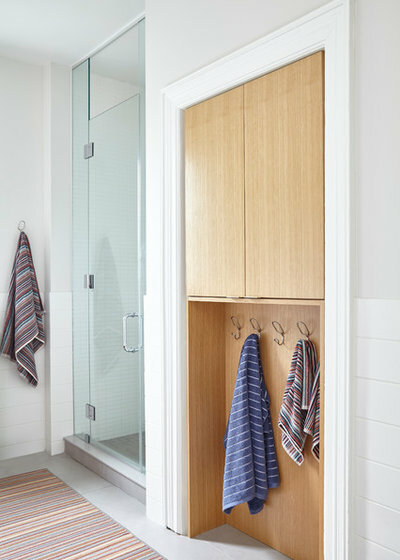 Features: Keep the family’s towels in order with stylish timber wall hooks. 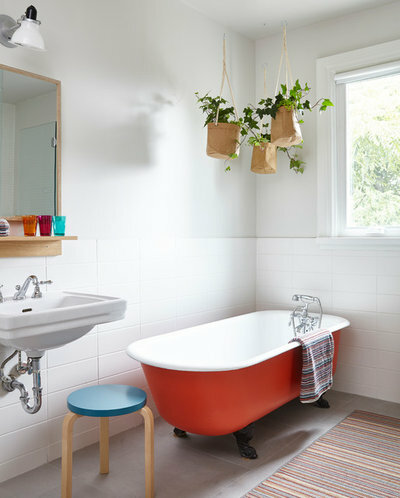 Features: Thick, cheery stripes and an arrangement of kids’ artwork hung on the wall makes bath time fun. 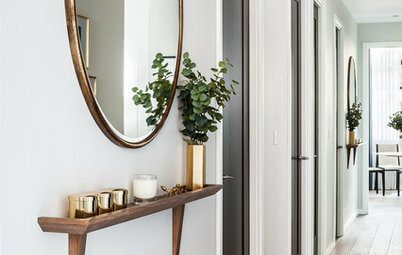 …here’s a second look at that gorgeous space. 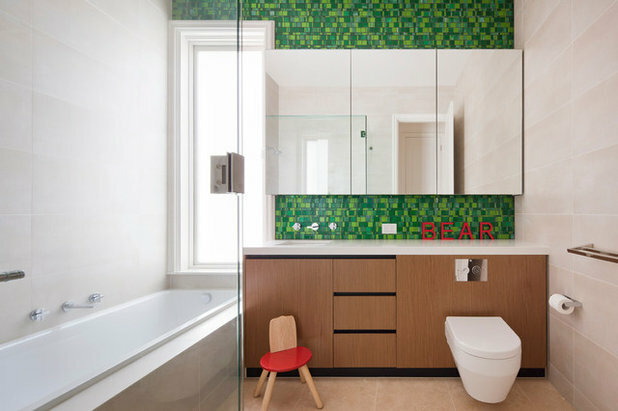 Features: Two basins and mirrors at various heights to suit children of different ages. 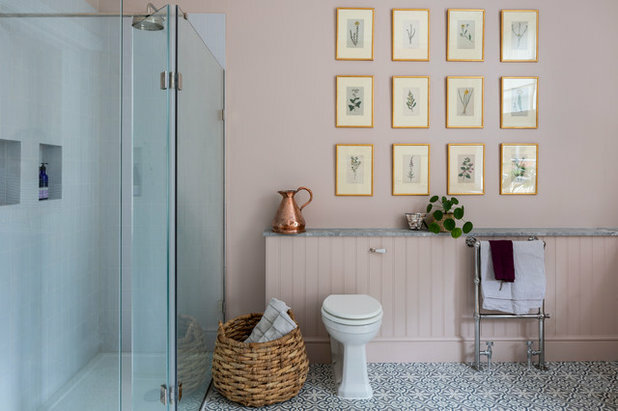 Features: Double basins and a vanity that runs the full length gives this family plenty of space to get ready in the morning, while a feature wall in penny-round mosaic tiles adds wow factor. 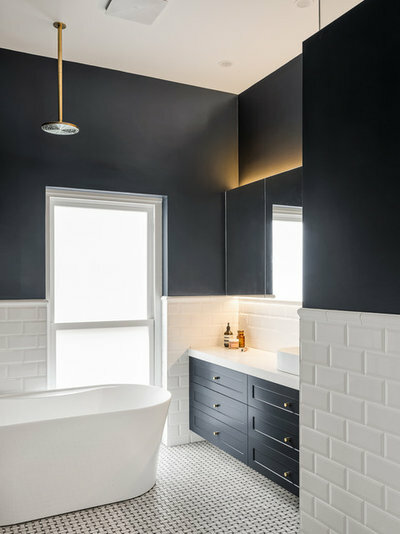 Features: Pops of blacks in the shower and window frames give this traditional family bathroom edge. 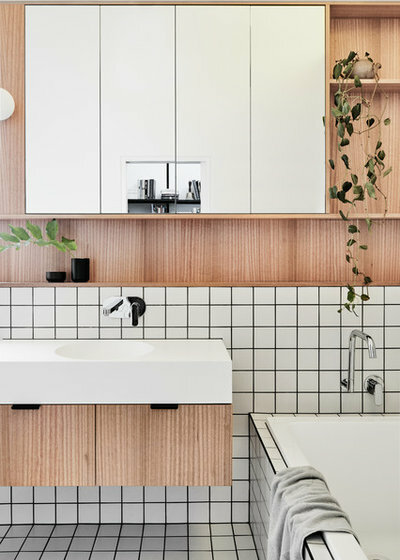 Features: Rich timber tones and dark-grey tiles add warmth, while a wall-mounted vanity that extends to bench seating makes smart use of a narrow space. 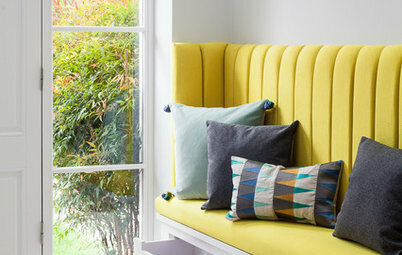 Features: Luscious layering of colour and texture sets an inviting tone. 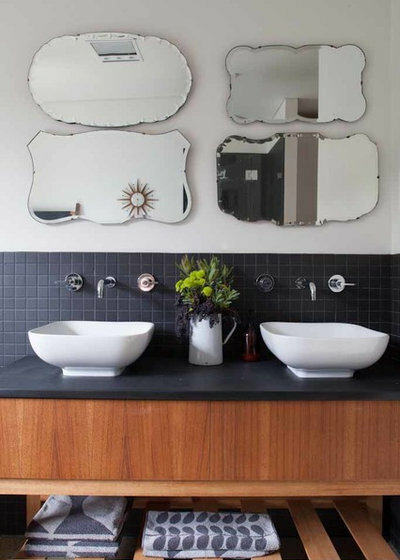 …meanwhile, at the other end of the bathroom, wall mounting the vanity maximises floor space so the room feels larger. 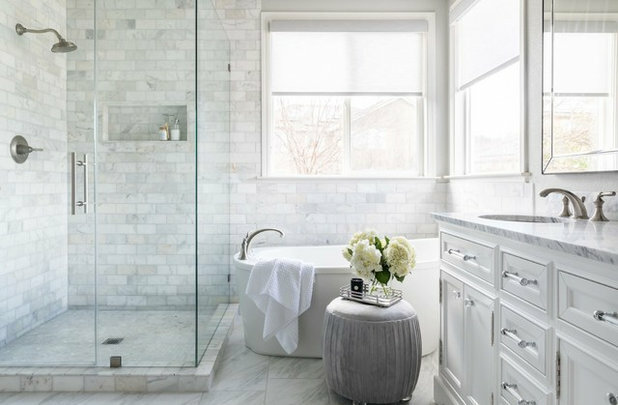 What are your must-haves in a family bathroom? Tell us in the Comments and don’t forget to save your favourite photos, like this story and join the conversation. 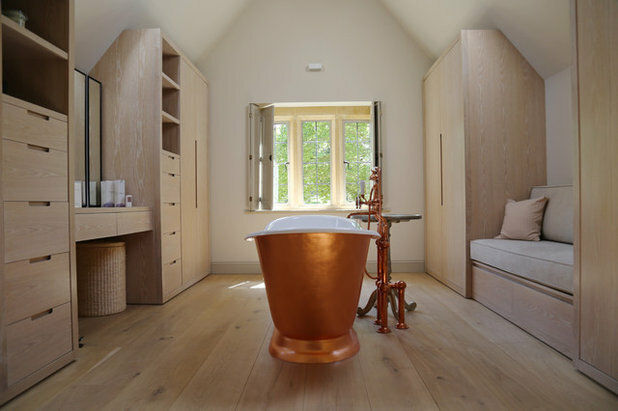 So many free standing bathtubs! 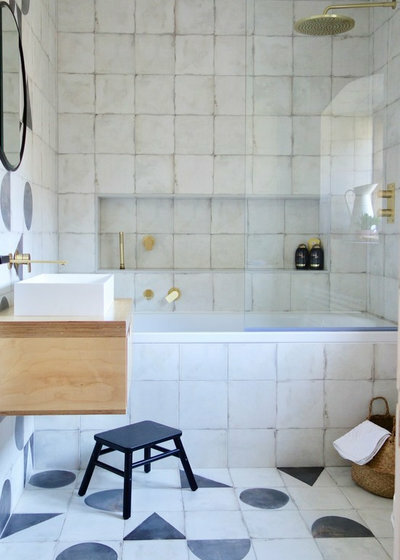 Have you ever tried to bathe a child (or even several of them)? 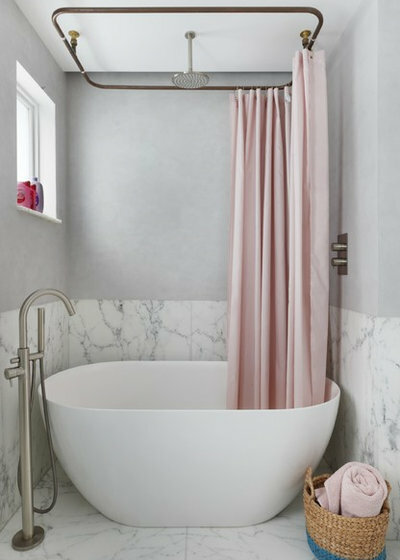 It's already a lot of work to wipe dry the walls and rim around an inbuilt bathtub. 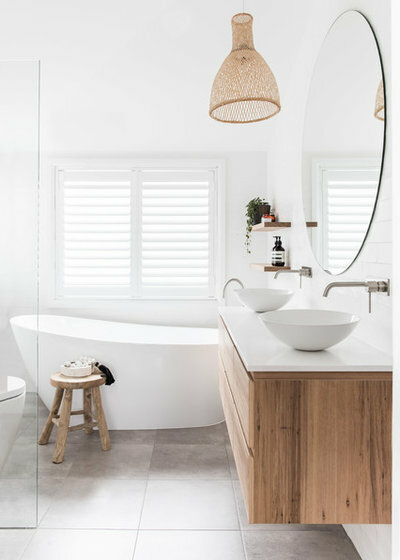 Imagine you have to clean up all the splashes around the tub on the floor! 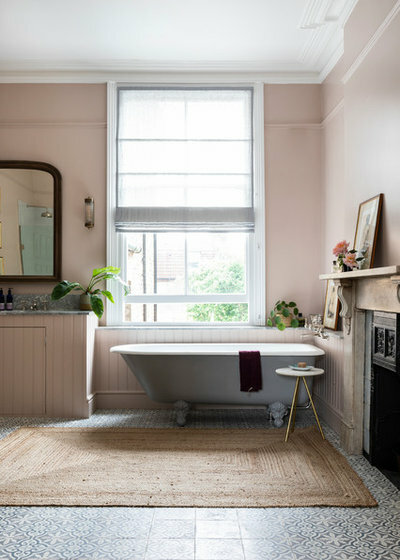 Absolutely agree with angelikagebhard's post in that free standing baths are well and good unless, like in so many of the examples shown, they're pushed into a corner or between 3 walls because it will be impossible for the householders to clean/dust behind them! So many architects/designers get it wrong because they're so focused on making a design impact that they forget about the ergonomic factor!! 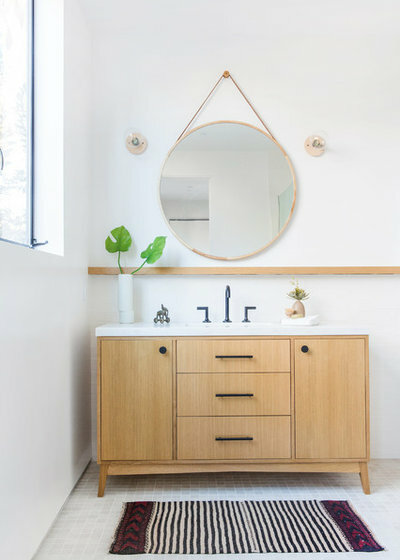 In my experience, when young children try to reach up to wash their hands in the modern basins that sit up on the bench, any water they might touch with their fingers, runs right down their arms and onto (or under) their clothing - even when they are using a step stool. They don't want to repeat the hand washing experience - at least not without a lot of assistance. 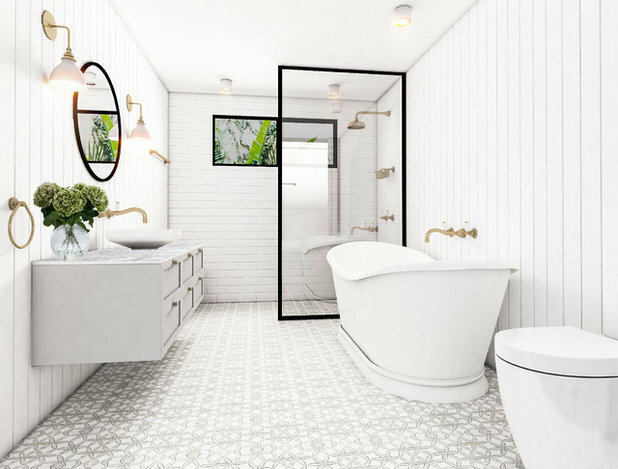 I am keen to see bathrooms thoughtfully designed for families with young children (from toilet training stage upward) as I reckon the more fashionable offerings are, at best, difficult for kids and actually create more work for parents and grandparents. I wonder if others find their children are disengaged from the fun of learning how to wash their own hands and discouraged from having toys in the tub due to all the effort that is needed to 'clean up' after cleaning up? How Do I... 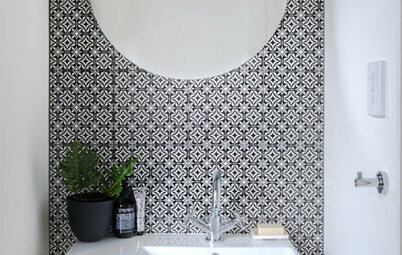 Choose Tiles for a Small Bathroom?